Other names: Madras thorn, Manila tamarind. Quamachil is a native of native of Central America but has now spread the tropics in all parts of the globe. 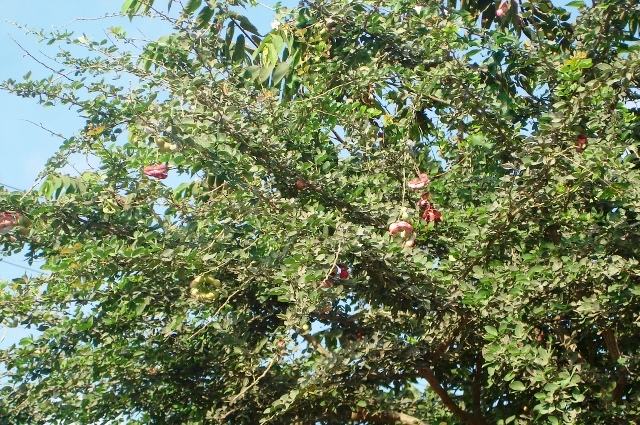 Though it bears edible fruits, but still in India it is grown mainly as hedge or for fuel. 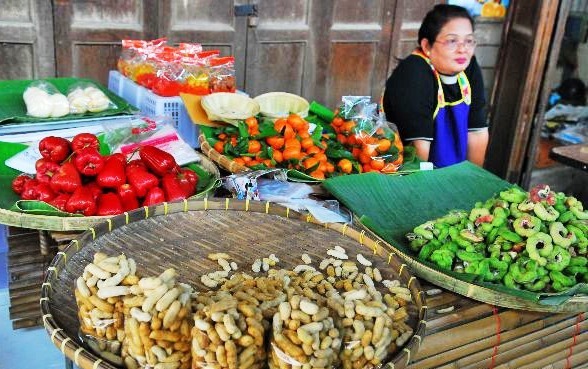 In Philippines and Indonesia, the fruit is even sold in the markets. The commonly used English names viz. Madras Thorn and Manila Tamarind are misnomers. This fruit has no link of nativity with these places at all. A shrub or small tree, up to 10 m tall, with glabrescent round branchlets, armed with straight, paired, stipular spines, 4-10 mm long. Leaves abruptly bipinnate with a single pair of pinnae only; rachis 1-2.5 cm long; pinnae with rachis up to 7.5 mm long with small terminal stipular spines; leaflets two per penne, opposite, sessile, ovate-asymmetrical, 1.5-3.5 cm x 1-2 cm, glabrous. Inflorescences in terminal panicles, puberulent, up to 10 cm long; peduncles 1-2 cm long, nearing globular heads with 15-20 sessile whitish flowers; calyx and corolla tubular, 1.5 mm and 3.5 mm long respectively; filaments white. Fruit (pod) flattened, linear-oblong but curled, up, 1 cm wide, fleshy coriaceous, reddish-brown. Seeds flattened, obovate-asymmetrical, 9 mm x 7 mm x 2 mm, blackish, with a thick, spongy, rather dry aril. 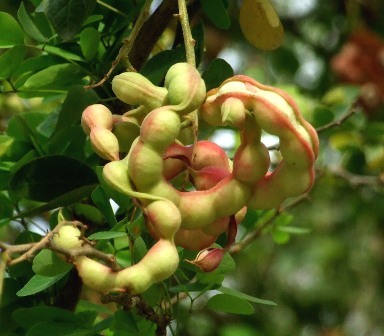 The aril in the pods of quamachil forms the edible part. It is sweet but sometimes can also be slightly astringent. There is a large variation in fruits with respect to taste and quality. In Philippines, some varieties have also been selected. The edible portion or the aril constitutes 50% of the fruit. 100 g of edible portion contains, water 75.8-77.8 g, protein 2.3-3 g, fat 0.4-0.5 g, carbohydrates 18.2-19.6 g, fibre 1.1-1.2 g, ash 0.6-0.7 g, calcium 13 mg, phosphorus 42 mg, iron 0. mg, sodium 19 mg. potassium 20.2 mg, vitamin A 25 IU, thiamine 0.24 mg, riboflavin 0.1 mg, niacin 0.6 mg and vitamin C 133 mg. The energy value is 330 kJ/100 g.
The seeds yield oil is also edible. The seed meal is used as an animal feed. The leaves when applied as a plaster can allay pain of venereal sores and relieve convulsions and taken with salt can cure indigestion, but can also produce abortion. The root bark may be used to cure dysentery. Tannin-used to soften leather-can be extracted from the bark, seeds and leaves; the bark is also used to dye fish nets. Quamachil is a common roadside tree in Indonesia, especially in the towns. There it is pruned in to a shapely avenue tree. There also exists a variegated mutant which is popularly grown as a pot plant. It is only in the Philippines that it is grown for its fruits. The most commonly used method for propagating quamachil is seed. The seeds take about 2 weeks to germinate. Superior varieties should be propagated asexually by marcotting, grafting or budding. Quamichil is a very hardy plant and does not receive any treatment other than occasional pruning after the young plant gets established in the field. Pests and diseases do not create any serious problem. The pods split open at the lower suture at maturity. This exposes the edible aril. The fruit does not keep long because of this and have to be consumed within a few days. Quamachil is very specific in its climatic requirements and grows well at low and medium altitudes in both wet and dry areas under full sun light. Although well-drained soil is best, it can also grow successfully in heavy clay soils. Seedling trees take 5-8 years for coming into bearing. 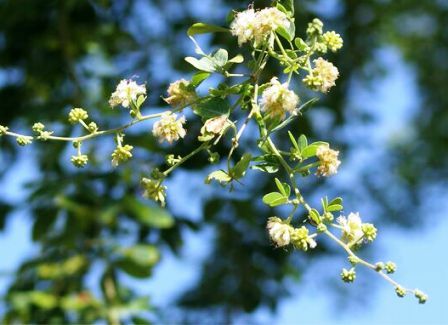 In the Philippines they flower from October to November and bear mature fruits in abundance during January and February; in west-Java bloom is between April and June and the pods ripen 2-3 months later, from June to August.